Do you remember what you were doing 7 years ago today? I had the worst kidney infection of my life. The night before I was taking a shower and I was in so much pain I passed out. My husband called my boss and told her what was going on and she agreed to work for me the next morning. I somehow made it through the night, although, looking back I should have gone to the emergency room. But I had a sweet 3 month old baby and didn’t want to take her there in the middle of the night. The next morning we didn’t know the world had changed forever. We didn’t turn on the TV, we didn’t listen to the radio. We rode in silence to the clinic hoping that if we were there right at 9:00, I would be the first one on the list in the Urgent Care department. I was in so much pain. When we arrived, everyone at the clinic, doctors, patients, nurses, receptionists, were huddled around the waiting room TV. Some were crying, some were sitting in shock, others were discussing what was going on, and all of us were trying to figure out what just happened. I remember thinking that I was in so much pain I wanted the receptionist to get back behind the desk to check me in. They sent me back to an exam room even though the doctor wasn’t there yet. The nurse asked if I wanted to watch TV and I said no. I just wanted to lay there and most of all I wanted the pain to stop. Eventually the doctor came, I peed in a cup, the doctor diagnosed me with a kidney infection and sent me on my merry way. I remember he prescribed me the antibiotic Cipro, which ironically enough, was given to the anthrax patients a few days later. I couldn’t nurse and take Cipro so I had to quickly wean my daughter. That was so painful. My day was basically spent on the couch trying to sleep and hoping the lortab would kick in. I would take Tylenol which would break my fever and I would wake up covered in sweat and milk. I changed my pajamas a million times that day. Casey sat in front of the TV all day watching the footage over and over again…I think like most people did. Every channel was 9/11 coverage and it stayed that way for at least a week. It felt like nothing would ever go back to normal and we would never feel right about laughing again. It didn’t really hit me about what was going on until my best friend’s Mom called me. My best friend moved to New York City right after she graduated from college in 2000. She called me at the request of my best friend to tell me that she was okay. I started crying immediately. Then I called my Mom and when I told her my best friend (who my Mom considered a third daughter) was okay, she started crying as well. I took pictures of Ground Zero but it felt sacrilegious to do so. But I did it because I never wanted to forget how I felt standing there. Thousands of people died needlessly and for no reason at all. The worst was seeing people jump to their death because that was better than being burned alive. I can’t imagine the terror they must have felt. Out of a terrible tragedy, our nation banded together as one. Ordinary men and women became heroes as they tried to save each other. Children lost their fathers and mothers that day, women lost their husbands, husbands lost their wives, and America lost it’s innocence. For these reasons, we should never forget what happened on September 11, 2001. I got this in an e-mail from my sister. It’s always good to remember our history so we don’t take for granted the privileges and obligations we have today. “Remember, it was not until 1920 that women were granted the right to go to the polls and vote. 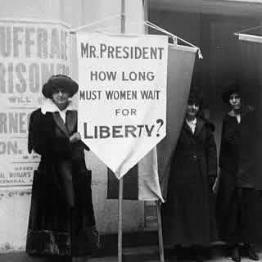 The women were innocent and defenseless, but they were jailed nonetheless for picketing the White House, carrying signs asking for the vote. (Lucy Burns) And by the end of the night, they were barely alive. Forty prison guards wielding clubs and their warden’s blessing went on a rampage against the 33 women wrongly convicted of ‘obstructing sidewalk traffic.’ They beat Lucy Burns, chained her hands to the cell bars above her head and left her hanging for the night, bleeding and gasping for air. (Dora Lewis) They hurled Dora Lewis into a dark cell, smashed her head against an iron bed and knocked her out cold. Her cellmate, Alice Cosu, thought Lewis was dead and suffered a heart attack. Additional affidavits describe the guards grabbing, dragging, beating, choking, slamming, pinching, twisting and kicking the women. Thus unfolded the ‘Night of Terror’ on Nov. 15, 1917, when the warden at the Occoquan Workhouse in Virginia ordered his guards to teach a lesson to the suffragists imprisoned there because they dared to picket Woodrow Wilson’s White House for the right to vote. For weeks,the women’s only water came from an open pail. Their food–all of it colorless slop–was infested with worms.